Matt Hadley and I left Bromont on Monday and headed to Tremblant for the second stop on the Canada Cup circuit. There, we were hooking up with a couple more maritime mountain bikers to spend the week in a Cabin on Lake Dufour. We spent our time getting to know the area better, giving our bikes some TLC after the Bromont mudfest, eating, movie watching… and for me, dialing in my descending speed so as not to be scooped for the win twice in a row. The weather improved continuously showering us with sunshine rather than raindrops. For once it looked like we would have a dry race at Tremblant! The course was in good shape, pretty much the same as last year with lots of single track but a more substantial climb than last weekend. Friday night saw some showers, but the morning brought the sun and temperatures in the low to mid 20’s. The women were slotted for 4 laps and I was ready to go. Off the start I fell back to 5th, but after about 500m the girls looked like they were settling into a pace so I took that opportunity to attack and go off the front. Getting into the single track first was going to be crucial to success and I wanted it badly. I drove hard on the first lap making as much use of my fitness as possible. The course was slick after the rain and early races, but I was able to make out alright. By lap two I had opened 2 min on second place, but I new I had to continue racing scared to win. 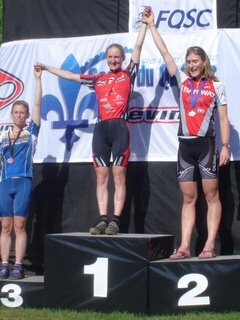 The course was a blast with all the singletrack and hammer climbs and I was able to maintain my lead to the finish. Mical rode in 1:30 after and then Karen Dewolfe at 5.17 followed in a close battle by Amanda Sin and Jean-ann Mckirdy. It felt great to get the win and although I wasn’t able to move into the leader’s jersey, I have that motivation to spur me on next weekend. It should be a good battle! My Norco Teammate Roddi Lega finished 7th in the men’s field, with Hadley coming in 9th. In the DH Norco rider Justin Brown had a wicked ride finishing 4th. My Bro and friend Goss after finishing 2nd and 1st at Bromont both had crashes this weekend and finished 10th and 5th respectively. Still pretty sweet. After spending a couple hours at the complimentary spa today it is with high spirits we head to Hardwood Hills tomorrow. We’re planning to go the scenic route to Barrie, stopping for a hike at Camp Fortune.